Do you ever put off reading a book (say, let it molder in your TBR pile for a year and a half), and then read it and wonder, why didn't I read this sooner? The Warrior Heir is one of those books for me. 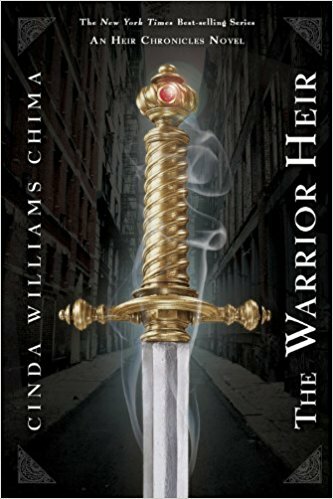 The Warrior Heir is a unique combination of small-town life and high fantasy. In Chima's worldbuilding, seven families gained magical powers after finding a dragon's hoard in a lost valley in the UK. Their descendants belong to one of five groups of magics: wizards, sorcerers, enchanters, seers, and warriors, each born with a stone behind his heart proclaiming his power and his place in the world of the Weir (the magics). Wizards rule the other classes, the underguilds, using them for their amusement or advantage. And, unfortunately, the Battle of the Roses is still going on in for them. The wizards of the Red Rose and the wizards of the White Rose, to prevent the killing of too many wizards, established The Game, a tournament in which the warriors fight, one for the Red Rose and one for the White Rose, to determine which side controls the Wizard Council. It's a bloody game that's gone on for centuries. But all of this is unknown to the non-magical, and to Jack Swift, a sixteen-year-old highschooler in small-town Trinity, Ohio. He'd had heart surgery as a baby, but is now in pretty good shape, thanks to his daily medication, and lives a normal life. He's focused on keeping up his grades and making the soccer team, but when he forgets to take his heart medicine one day, things start to change. He feels more alive and stronger than ever before, and is somehow able to send the bully Lombeck flying into the soccer goal without touching him. His small town is suddenly flooded with strangers, and danger, and Jack learns he's one of the last of the warriors and is destined for The Game. Overall, I'd give The Warrior Heir 4.5 out of 5 stars. The prologue was a little confusing, as Chima didn't take the time then to explain the terminology of the different guilds and their history, but it captured my attention, nonetheless. The main character, Jack Swift, is likable. Unlike many YA books main characters, Jack isn't a walking attitude, nor inherently talented at everything, nor a please-connect-with-me-because-I'm-impossibly-accident prone loser. He makes good grades, has close friends in Will and Fitch, respects his mom, and has a good chance at making the soccer team (even before his warrior powers manifest). I also liked his friends and many of the other characters. In addition, the plot was intriguing, clues were handed out at a good pace, and their was plenty of action but neither too much action nor violence (though there is that). I liked the small-town feel and the relationship between Jack and his friends, as well as his burgeoning relationship with newcomer Ellen Stephenson, and the love his Aunt Linda has for him and how she tries to protect him from The Game. My main caveats with the book are the magic and the behavior of some of the adults. I prefer magic to be strictly fantastic, and by that I it mean stays away from the "magic" people in real life engage in--astrology, fortune telling, card reading and so on. Those are part of the practices of some of those in the Weirgild. Also, Jack's beloved, "irreverent" Aunt Linda, an enchanter who'd do anything to help Jack, isn't always the best role model, tossing back beers after a nearly disastrous run in with the wizards of the Red Rose, and she and Leander Hastings, a very complicated character, were said to have been "together" at one time, but that probably wasn't a clean romance story. Aside from those things it was a great book, with excellent writing, mostly likable characters, and a strong value on life as Jack has to confront the idea of taking a life as he trains for The Game. 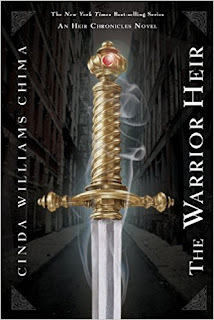 Have you ever read anything by Chima? What kinds of magic do you feel comfortable with in fantasy, or uncomfortable with? Thanks for the review! Believe it or not, this series has been "moldering" on my TBR pile for a while now. Sounds like I need to give it a try! Actually, I kinda thought it would a book you'd either have read or would want to read. I think you'll enjoy it.